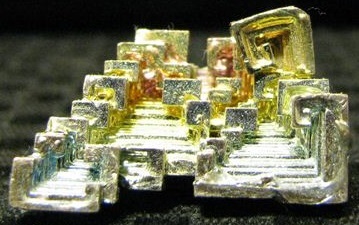 This beautiful bismuth mineral specimen shows a classic example of the stepped formation that bismuth is known for. This is a naturally occurring piece measuring approximately 1 inch at its greatest length. This piece shows a spectacular golden hue with almost every color of the rainbow including red, green, orange, blue and purple represented in this single piece. Bismuth is a element on the periodic table.